hightouchmegastore: The lemons that ate my paycheck. Yesterday, when I was shopping for food at Wild Oats, I saw these lemons--a golden yellow, weighty, heavy in the hand, which means, usually, more juice per lemon. Then I looked at the sign. Say what? Meyer lemons? The lemons of lore and fable? "The Meyer Lemon (Citrus meyeri) is thought to be a cross between a lemon and an orange. They are thought to have originated in China about 400 years ago. The Meyer Lemon was introduced to the U.S. from China by Frank Meyer in 1908. Meyer lemons look like a large orange, with a very soft edible skin. They are sweet, juicy and fragrant, and are excellent in vinaigrettes and sauces, or sliced skin and all in salads. 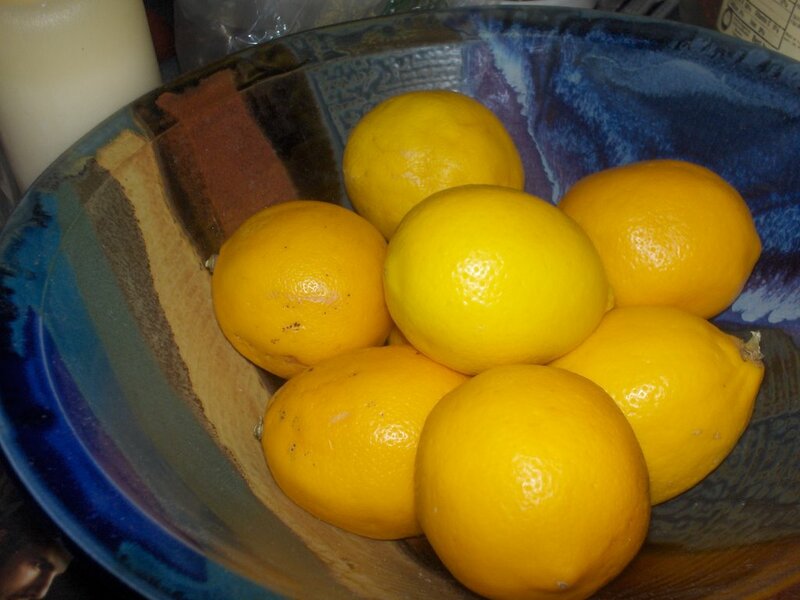 Meyer Lemons were mainly grown as ornamentals, but they are appearing more frequently in food markets." Skin and all! I declare. I had never, ever seen one in a store where I shopped. Well, I figured I better buy me some and decide what to do with them later--maybe make the cake as an homage to Alice Waters. So I picked eight of them and put them in a bag. They were $3.99 a pound, but I didn't weigh them, because they're lemons! Lemons are light, usually. I don't usually weigh lemons. So I got up to the cashier. She rang up the lemons as if they were ordinary, mere mortal, organic lemons at 2 for a dollar. I corrected her: "Those are Meyer lemons, I think they're a little more," I said, knowledgeably, pedantically, all full of snooty Chez Panisse esoteric produce names. Serves me right. Those are $24 lemons, lovely as they are, in the picture. $24! My God. Should I have put them back? Should I have cried out a California French expletive in protest at the absurdity (l'absurdite?) of these trop cher citrons? As you can see, I caught my breath and bought them. There will be a Meyer lemon cake or a really amazing lemon pie in the offing, mark my words. Either that, or I will slice them thinly, skin and all, for a hella expensive salad. I like Wild Oats, but then they closed both of their stores in my town. Bummer! I left a comment. Where did it go? see Ron's post for my rant about these disappearing comments. I'm too tired to reproduce it now. but I will tomorrow. I promise! Meyer lemons are good. You can get them at Liberty Heights and shock, surprise, they are cheaper than at Wild Oats. At least they were last year. I bought enough to make a cheesecake and there's no way I spent $24 on them. But I think it's ok to spend that much on lemons. But I always spend too much money on buying ingredients for things. Mmmm, I'm just thinking right now what a great lemon curd they'd make. I think I'll have to go buy some too. This piece has it all--the image, the cookbook, the French. I think you should send it to some cooking magazine. Still I'd never buy $24 lemons even if they were Meyer lemons. But maybe I judge too quickly: a couple of weeks ago I walked out of Great Harvest with a $9 loaf of cherry chocolate bread. I had no idea it would be that much (they gave us a free slice) but when she rang it up, I had no cajones and meekly took the bread mumbling mierda, mierda, mierda all the way. I will not comment on the sustainability of Meyer lemons since that would be far too puritanical of me. I will say, however, that perhaps they really do reflect the price on the distance they have come. But enough of that claptrap. So if they are sweet how can they be lemons? Your post is a brilliant reminder, HTMS, of how we should pause to consider our produce. The photo is brilliant btw. I had a similiar experience at Liberty Heist last summer, involving Heirloom Tomatoes. I nearly had a heart attack when she rang them up. But I did take them home and they were delicious. I am now craving lemon bars, or some other delicious citrus treat. I so agree with you, Clint, although eating oranges at all in Utah raises a similar problem--if they're U.S. oranges, they come from CA or FL. I think these lemons came from CA. No diff, really, except the snoot factor. They're sweet, the experts suppose, because of an orange tree in their history. Nice. I had a Meyer Lemon tree in Portland in my greenhouse. It got aphids, but before that....nothing better than a meyer lemon straight from the tree.